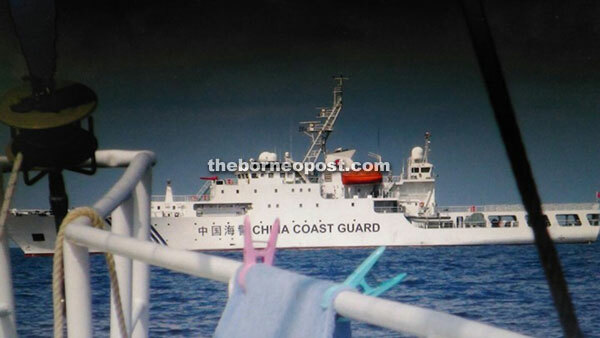 According to local fishermen, the China Coast Guard vessel is still anchored at Luconia Shoals. MIRI: Local fishermen are expressing their deep concern over the presence of a China Coast Guard vessel anchored at Luconia Shoals. According to Miri Fishermen Association chairman Councillor Jamali Basri, the ship has been there for the past two years. “Many deep-sea fishermen here are afraid to go near (Luconia Shoals) because of the vessel. They are urging the state government to step in, possibly by putting some sorts of signs or our (national) flags there to show that the area belongs to Malaysia. This, I believe, would make us less worried about fishing near that area,” he said yesterday. Jamali also claimed that there had been an incident where a local fisherman was threatened by armed men on board the Chinese ship. He thus advised all local fishermen who had ever been threatened by those on that vessel to lodge police report so that action could be taken against them. The area, also known locally as ‘Gugusan Beting Patinggi Ali’, is located about 84 nautical miles off here. On June 2 this year, Minister in Prime Minister’s Department Datuk Seri Shahidan Kassim in a press conference here said there might have been intrusion by China in Malaysian waters, based on the presence of the republic’s Coast Guard vessel at the Luconia Shoals over the past two years. The minister also stressed that as the area belonged to Malaysia, the government would do whatever it takes to protect and defend Malaysian waters in the South China Sea from being encroached on by intruders or unlicensed foreign fishermen.